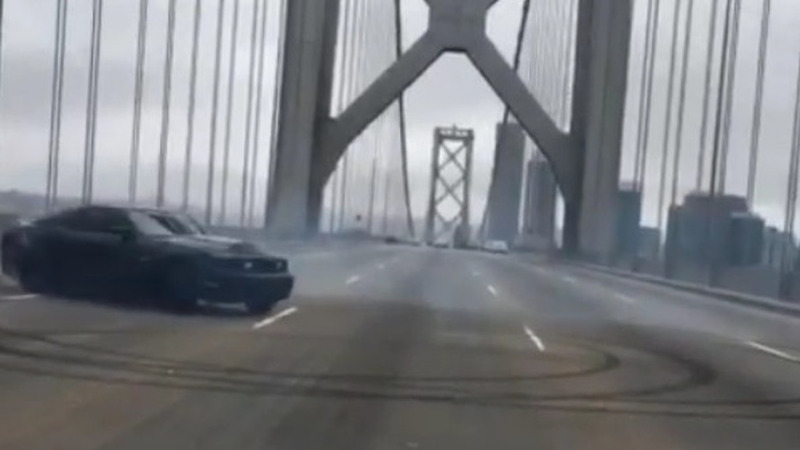 A Ford Mustang owner is probably rethinking his life choices following a stupid stunt on San Francisco's Bay Bridge. According to NBC Bay Area, a Chevrolet Camaro and two Ford Mustangs were causing havoc on the bridge as their drivers were weaving in and out of traffic at speeds up to 90 miles per hour. The recklessness didn't end there as the cars eventually passed through the Yerba Buena Island tunnel and brought traffic to a halt so the owner of the black Mustang could do a couple of donuts on the bridge. This was too much for one fellow motorist who quickly contacted police and told them what was going on. Police were waiting for the cars at the end of the bridge and the California Highway Patrol pulled two of the drivers over. The owner of the black Mustang was arrested and had his vehicle impounded. The driver of the white Mustang received a citation for speeding and was released, while the third driver appears to have gotten away scot free. This isn't the first time drivers have preformed donuts on the Bay Bridge as The Los Angeles Times notes about 50 cars were involved in a similar incident in April.